1. Cook the sausages according to the packet instructions, then slice thickly and set aside. 2. Meanwhile, spray a large non-stick frying pan with low calorie cooking spray and place over a medium heat. Add the onions and garlic and stir-fry for 4-5 minutes or until soft. Add the peppers and stir-fry for 3-4 minutes. 3. 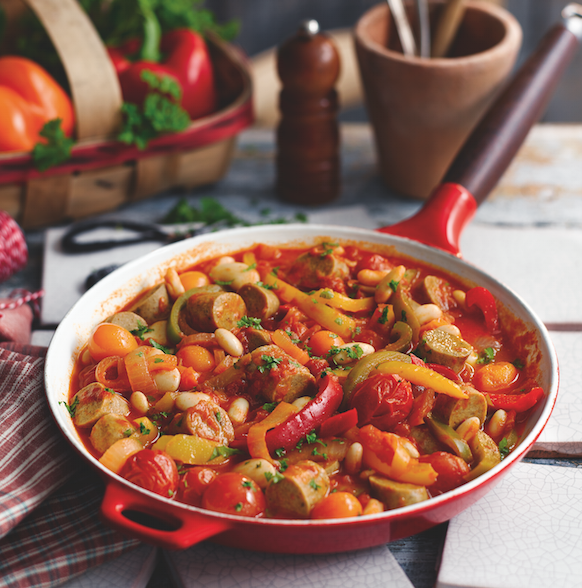 Stir in the paprika and cook for a few more minutes before adding the canned tomatoes, tomato purée, stock, beans and plum or cherry tomatoes. Season to taste, cover and simmer for 5 minutes, then add the sausages and cook for another 5 minutes. 4. Scatter over the parsley and serve hot.